and forums give photographers the opportunity to showcase their images and offer friendly discussion on photography topics of all kinds. Diverse editorial content highlights photography articles on a variety of topics including techniques, tips, location reports, and gear reviews. Hundreds of attendees have traveled the world with us on our workshops alongside some of the best leaders in the industry, who have graciously taught and guided them on their professional photographic journeys. NatureScapes portfolios give paid members a place to host their own image gallery for exposure. We are an authorized retailer of professional photography gear. Shop our online store at guaranteed lowest prices and everyday free ground shipping in the continental United States. Our goal is to be an invaluable resource for nature photographers. By offering relevant content and nourishing a constantly growing community of photographers, our website offers a major contribution and positive force to the craft of nature photography around the world. Are you a talented and driven photographer and want to join the ranks at NatureScapes? Send an email to editors@naturescapes.net and tell us about yourself! Greg Basco is a resident Costa Rican professional photographer and environmentalist who enjoys a working relationship with Canon. He is a Veolia Environment Wildlife Photographer of the Year and Nature’s Best Windland Smith Rice prizewinner, and his photos have been published by National Geographic and other magazines and have been used in many books, public exhibits, calendars, and other projects. Greg’s latest work in progress is a coffee table book of artistic photos from the rainforest. In addition to his own photography, Greg truly enjoys working with tour clients to help them improve their photography and capture great photos of their own in the challenging habitats of Costa Rica. Indeed, he liked it so much that a few years ago he founded Foto Verde Tours, Costa Rica’s first and only travel company specializing in photographic tourism. Greg has been working for the past few years with NatureScapes co-founder Greg Downing to run hummingbird photography workshops in Costa Rica. Check out Greg’s website at www.deepgreenphotography.com. Alain Briot approaches photography as a Fine Art. Alain’s goal is to express his personal vision of the subject rather than depict reality in a factual manner. Originally from France, Alain first studied painting and drawing at the Academie des Beaux Arts in Paris, before studying photography. His painting and drawing studies defined his approach to photography. Alain works with large format film, medium format digital and 35mm digital. The choice of camera is based on Alain’s vision for each image. Alain’s goal is to create the most exciting photographs possible, bar none. His equipment, be it cameras, software, printers, etc. is chosen for its ability to make this possible. Alain’s vision of the landscape is of a place of beauty, a place where we can experience a direct contact with nature. For Alain the landscape is a place where we can find respite from the pressures and stresses of the 21st century. It is also a place where we can find inspiration and freedom of expression. In addition to his Fine Art work, Alain teaches workshops, writes essays and publishes books and DVD tutorials. Alain is the author of Mastering Landscape Photography, Mastering Photographic Composition, Creativity and Personal Style, and of Marketing Fine Art Photography. All three books are published by Rocky Nook. Alain is also the author of the Mastery Workshops on DVD series. Alain is a columnist for several websites. His writings have been translated in over 15 different languages. You can find Alain’s photographs, read his essays and subscribe to his free newsletter on his website at www.beautiful-landscape.com. You can also email Alain directly at alain@beautiful-landscape.com. When Karen joined NatureScapes.net in the fall of 2015, she brought with her many valued years of administrative experience. With her attention to detail and strong work ethic, Karen takes on the tasks of Administrative Assistant and Retail Service Member at NatureScapes.net with enthusiasm. As a love of nature and the outdoors is a strong passion of hers, she continues to expand her knowledge of nature photography and all that it entails. When not working with NatureScapes.net, Karen enjoys time spent with family, camping, music, and relaxing on the river at her West Virginia retreat. Born and brought up in the British countryside, Carol was never happier than when following her father who was an avid outdoors man with a love of all wild places and the creatures who lived there. He taught her how to find and follow the tracks, sounds and signs of the different species, and how to share their world without intrusion. The necessities of life resulted in a varied career in mainly administrative roles with both UK and international organisations, while free time always involved her passions of wildlife and conservation. Dave exploded onto the scene with his combined loves of wildlife and photography and from day one it was obvious that this was the beginning of a whole new adventure. Not for them a conventional honeymoon—they chose to spend some time as the only guests of a Lion Research Programme in the wilds of the Okavango Delta in Botswana. Living under canvas with the four researchers and surrounded by the amazing wildlife, they were able to live and breathe the magic that is the untouched, remote Africa, an experience that will stay with them forever. As well as Botswana, trips to their other favourite area, Zambia, have resulted in some amazing adventures and experiences that can only come from spending time with wildlife in their natural environment, armed only with a camera. Invited by NatureScapes.net to become a Moderator on their Wildlife Forum in 2003, Carol feels privileged to be a part of such a wonderful and diverse collection of talented photographers who so freely share their experience and expertise. Having been inspired by Dave's sensitivity with his subjects, his amazing eye for the intimate and unusual, and the inspirational work of fellow NatureScapes members, her love of nature and wildlife photography will always be a major part of life. All her life Cindy has had an abiding love for the natural world. Her early years were spent in mid-New York State and Vermont where she maintained a strong interest in music and art. Cindy graduated from the New England Conservatory of Music and worked as a performing flutist and music teacher in Boston Massachusetts for many years. A move back to Vermont, where Cindy now lives, led to her present combination of interests. Music took a few new turns, and she became more serious about painting- in watercolors, primarily. Photography began to emerge as a means to capture subjects for her paintings, and gradually became another central interest. Both Cindy’s father and grandfather were photographers. She now integrates photography and art by creating what Cindy calls “photo-paintings.” Cindy’s art shows include paintings, photos, photo-paintings and recordings she has made of birds combined with her own harp improvisations. Cynthia has three websites including: Art website: www.creaturekinships.com, Photography website: www.pbase.com/creaturekinships, Blog: creature-kinships.blogspot.com. Ron has actively photographed wildlife for the past 15 years. Through the art of photography, his goal is to reveal the character of his subject in its natural surroundings, and he strives to achieve that objective by knowing and understanding the species. He has significant experience photographing the red fox, his favorite species. Ron’s work has been “Highly Honored” in the Windland Smith Rice International Awards, and has been a Tier One winner in NANPA’s Showcase competition. 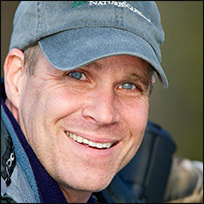 He is a member of the North American Nature Photography Association. You can view his images at www.rondayphotography.com. To see more of Greg’s work visit his website at www.gdphotography.com. While Bret enjoys seeing his work in print, he receives the most satisfaction by helping others realize their potential as photographers. He accomplishes this by leading several group workshops each year and guiding photographers on private photo excursions. For information about his workshops and guided excursions, visit www.moabphotoworkshops.com. To view a collection of Bret’s images, visit www.bretedge.com. Bob was born and raised in Westchester County, NY and has lived there all his life. Bob started taking pictures in high school where he was photo editor of the yearbook. He started out using Nikon equipment and used Nikon until 2002 when he switched to Canon and in 2009 returned to the Nikon camp. Bob has had a career in Information Technology and Management Consulting ultimately creating his own IT consulting company based in Somers, NY. While actively consulting Bob spends time in and around New York taking pictures and travels to locations such as Alaska, Bosque, Florida and Yellowstone time permitting. Bob is a past president of the Nature and Wildlife Photographers of Long Island (NWPLI) photo club. When the club won the Nature’s Best Club category in 2006, several of his images were chosen to be displayed in the Smithsonian Museum in Washington DC. Steve became interested in photography in the early 1980’s - first in high school and then college where he assisted in teaching a few classes. Early on Steve had the photojournalism bug. He headed to the Middle East and had the good fortune to be in Jerusalem in 1986 when the Intifada erupted. There, he did some work for a Palestinian newspaper and went through several K1000’s. Later on Steve developed more of an interest in wildlife and landscapes, aided by the conversion to digital in the late 90’s. Since then Steve has used Canon, Nikon, and Leica systems. Currently his photographic interests focus on landscape, macro and wildlife subjects, although he is equally fascinated by the software and hardware technologies that go into processing a digital image. Visit his website at: www.finesart.com. Neil grew up on a farm near the world famous Waitomo Caves in New Zealand, which naturally stimulated his interest in the outdoors. The photography bug bit Neil when his grandfather gave him his first SLR (a Pentax Spotmatic) as a teenager. In 2000, Neil graduated with a BSc in environmental science and has since worked with a Crown Research Institute on a range of terrestrial ecology projects. Neil has had a strong interest in birds for as long as he can remember (New Zealand is a land of birds after all), so they occupy a large amount of his photographic effort. Neil also enjoys trying to do justice to the country’s magnificent scenery, shooting New Zealand’s diverse but elusive reptiles, and exploring the macro world of the more easily overlooked but interesting components of native fauna. Visit his website at: www.neilfitzgeraldphoto.co.nz. Unlike many photographers whose passion for photography developed long ago as a child, Kristi first jumped into photography about six years ago. She started with a point-and-shoot and then progressed to an SLR and 600mm lens. She has been studying photography and shooting ever since. Kristi is passionate about the natural world and loves to lean about new things. She enjoys shooting all elements of nature, especially birds, and she strives for portrait style images. Photographing hummingbirds using a multi-flash set up has become a favorite of hers. Kristi is a native Texan and graduated from the University of Texas at Austin with a Bachelor of Science. She and her husband Mike have a wonderful eight year old daughter named Emily. Kristi’s goal is to have truly good pictures that are worth much more than a thousand words. Tim Grey is regarded as one of the top educators in digital photography and imaging, offering clear guidance on complex subjects through his writing and speaking. He has written more than a dozen books on digital imaging for photographers, including the best-selling Photoshop CS4 Workflow and Color Confidence. He has also had hundreds of articles published in magazines such as Digital Photo Pro, Outdoor Photographer, and PC Photo, among others. He publishes the Ask Tim Grey email newsletter, as well as the Digital Darkroom Quarterly print newsletter. Tim teaches through workshops, seminars, and appearances at major events and is a member of the Photoshop World Dream Team of Instructors. Visit his website at: www.timgrey.com. KK Hui is an amazing bird photographer from Hong Kong, China. He sees photography as an art allowing the photographer to ’paint’ the awesomeness of what he sees in nature—color, lighting and composition in his unique style. He has been a moderator for the Birds Forum in NatureScapes.net since June 2004. Colin Inman was born in the English Lake District in the mid 70’s, and grew up on his father’s farm. He has always lived in this beautiful corner of the world where his love of the natural world has developed and blossomed. While he has built a career in engineering, his love of nature in general and birds in particular has seen him sit on the council of Cumbria Bird Club & Walney Bird Observatory. When Colin became interested in photography then the obvious subjects were wildlife—mainly but by no means exclusively birds, and also the beautiful landscapes around him. John is a Chemical Engineer who lives in Alberta, Canada. He is an avid fly fisherman of over 30 years whose lifelong interest in photography has been reignited with the advent of DSLRs. Although John focuses primarily on photographing landscapes, cooperative insects occasionally provide him with opportunities to shoot macro subjects as well. Some of John’s images can be seen in his NatureScapes portfolio. Cindy enjoys photographing a variety of nature subjects, but birds are a current favorite. She loves to travel to see and photograph the amazing sights our planet offers. To share her travels with others, she regularly presents programs to local camera clubs and other organizations. Cindy supports the education and outreach programs of her local Audubon chapter with photos for a variety of uses such as a “Bird Bingo” game for children to play on bird walks. She writes a regular column and contributes photo essays for their newsletter. Cindy has been an active member of NatureScapes forums from the start, and has published articles on the site. She is currently serves NatureScapes as a member of the Editorial Team and as a Moderator in the Wildlife Forum. Joe McDonald has been photographing wildlife and nature for over forty years, and has been a full-time professional since 1983. He has been published in every major North American nature publication and is represented by several stock agencies. With his wife Mary Ann, Joe teaches photography and digital workshops from his home in central Pennsylvania. Additionally, he and his wife spend at least 50% of an average year traveling, leading photo tours and safaris for photographers. Joe is a master of electronic flash, and regularly incorporates flash into his high-speed action work. That, and capturing defining moments, such as action or a telling portrait, is his photography specialty. His favorite location for photography is the East African countries of Kenya, Tanzania, and Rwanda, and Joe has had seven BBC Wildlife Photographer of the Year winners from this region. In 2009 this duo completed their 50th mountain gorilla trek in Rwanda. Visit his website at: www.hoothollow.com. Alan Murphy has been captivated by birds since his childhood in England. Even in his youth, Alan found himself inextricably drawn to nature; growing up he found solace from the trials of life under a canopy of trees while in the company of birds. Upon immigrating to the United States, Alan found himself overwhelmed and somewhat intimidated by the diversity of bird species. He began photographing birds twelve years ago as a way to help distinguish the subtle variations of different species. Alan lives in Houston and is a full time bird photographer who leads bird photography workshops. Alan’s numerous photo credits include National Geographic, Birding, Birders World, WildBird, Bird Watcher’s Digest, North American Birds, Texas Birds, Texas Parks & Wildlife, Texas Highways, British Birds, and more. His photos have been published in field guides, books, CD-ROM’s, calendars, and postcards, including two books on bird photography that he has authored. Visit Alan’s website at: www.alanmurphyphotography.com and his blog at: www.alanmurphyphotography.com/blog. For Jim, photography has been a passion since age six, when he got a box camera for his birthday. In junior high, high school, and college, Jim worked as a photographer for his school papers. Jim worked his way through high school and Amarillo College in a commercial studio and was a partner in a studio in Austin, Texas before he began working with computers in the mid 1960s to support his family. Nature photography has been a strong interest of Jim’s for many years and a burning passion since 2001 when digital imaging became an intense interest. Over the years Jim has accumulated the desired bird and nature photography equipment and now uses Canon digital cameras and lenses with Adobe Photoshop as his image editing tool of choice. Jim recently retired from the computer consulting business and now concentrates on nature photography as a vocation/avocation. Visit his website at: www.jneely.net. Richard specializes in nature and wildlife photography, but will point his camera towards any subject if inspired to do so. Between shifts at his job in the media industry he can be found out with his camera, enjoying all that England has to offer. Although London based he also spends a lot of time in America, specifically Florida which has become almost like a second home, and as a result has had images published in both UK and U.S. magazines. You can see more of Richards’ work on his portfolio site and also follow his photography from a more personal and informative perspective, by reading his ever growing blog. Visit his website at: www.richardpeters.co.uk and his blog at: www.richardpeters.co.uk/blog. Toma was born and raised in Pennsylvania. She has an Associate’s Degree in computer programming; her career took her to upstate New York as a healthcare software developer in Burlington, Vermont. She continued to expand her programming skills by learning languages such as RPG ILE, COBOL, COOL2E, and Visual Basic. She moved back to Pennsylvania and continued her education in IT and became A+ certified. Her career then advanced to IT Management and now Business Administration. Toma brings years of computer experience and business management skills with her to NatureScapes.net. Her passion is horses; for the past 30+ years she has shown horses and given riding lessons. She currently owns and operates Pine Valley Farm, a horse boarding facility in Glen Rock, Pennsylvania: pinevalleyfarm.webs.com. Jim has been taking images for over 40 years. For 27 of those years he was a dedicated orthopedic surgeon. For at least 10 years he took primarily family pictures and then planned vacations at many scenic U.S. locations at their prime times after stumbling on Outdoor Photographer magazine. All changed in 1992 when he went to Alaska with a 300 f2.8 lens. This was his first experience with large mammals and he has endeavored ever since trying to capture wildlife images. Jim has been a workshop participant with many NSN moderators over the years learning from their expertise. He retired early in 1999 and since then his traveling has expanded enabling him to photograph all over the world including Antarctica, Africa, Japan, Iceland, India and numerous trips to Canada. Jim has been an active member of NSN since its inception. His images have appeared on calendars, Birder’s World magazine, Nature’s Best magazine, and Audubon publications. Jim’s love of the outdoors and trying to capture the beauty of nature extends from macro to both birds and mammal photography. He continuously strives to tailor his travels each season to what nature offers. Since 1995 he has submitted stock images to Superstock.com. Jim periodically updates his images on his website: www.jimurbach.smugmug.com. Jan has had a great passion for birds and photography since he can remember and he became involved with both at a very young age. In recent years, his passion has grown more serious and he has traveled to many places all over the world to photograph birds including Canada, USA, Norway and many other European countries. Jan is a 23 year old business student at the Berlin School of Economics and lives in Berlin, Germany. After he graduates from University, he hopes to be able to spend even more time on bird photography and traveling to eventually become a pro photographer. Visit his website at: www.vogelfotografien.de. Tom Whelan is a nature photographer and naturalist who specializes in close-up photography of plants and insects, portraits of wildlife, and intimate landscapes. His images range from abstracts of natural designs, to butterfly portraits and high magnification images of ice crystals, to forest and waterfall scenes. Tom is active in conservation and land stewardship in his home area in Massachusetts, working on invasive plant removal projects, fund raising for conservation projects, and serving on the board of a town conservation organization. He is a member of the Massachusetts Audubon Society, the North American Butterfly Association, and the Massachusetts Butterfly Club. His clients include the City of Aspen, Colorado, Trent University, Ontario, the North American Butterfly Association, the Boston Museum of Science, and others. Tom’s photographs have won awards in competitions sponsored by the National Wildlife Foundation and the North American Butterfly Association. Visit his website at: www.whelanphoto.com or his blog at tomwhelan.wordpress.com. A professional photographer herself, Carolyn has the legal credentials and the experience to protect your rights.Carolyn wrote the book, the “Photographer’s Legal Guide,” which was released in 2006 and updated in 2010. Carolyn specializes in wildlife photography and also provides legal information for photographers for free at www.photoattorney.com.